Archives : WEEKLY BULLISH ENGULFING - 28/06/2013. WEEKLY BULLISH ENGULFING – 28/06/2013. The past week can be divided in two parts, the first half where the market was in Bear grip as it continued to move lower, and the second half where the Bulls made a strong comeback overpowering the bears and gaining some of its lost ground. Friday saw a big Bullish Rising gap being formed on the Sensex (18925-19093) and the Nifty (5699-5749). The Gap can be classified as a Bullish Breakaway gap as it is signaling a start of a Bull rally. This gap is the second part of the Bullish Island Reversal which got completed on Friday. As a result we are now retracing the fall from Sensex 20443 to 18467 and Nifty 6229 to 5566. The Correction levels are 19222-19455-19688 for the Sensex and 5819-5897-5976 for the Nifty. Sensex opened the week at 18714, made a high of 19432, low of 18467 and closed the week at 19395. Thus it registered a strong weekly gain of 621 points. At the same time the Nifty opened the week at 5638, made a high of 5852, low of 5566 and closed the week at 5842. Thus the Nifty went up by 175 points on a weekly basis. Both the indices have formed a big white body candle on the weekly charts which completely engulfs the previous week’s black body candle, thus forming a Bullish Engulfing pattern which is a Bullish Reversal pattern. On the daily charts both the indices have formed a big Opening White body Marubuzo on Friday which clearly suggests that the trend in the short term as well as the weekly trend has turned bullish. Both the indices have left behind a Bullish Rising gap between Sensex 19093-18925 and Nifty 5749-5699 due to the gap up opening on Friday. This gap should act as a support when required. This gap marks the beginning of a bull rally and hence it can be termed as a Bullish Breakaway gap. Also this gap now completes a Bullish Island Reversal pattern on the daily charts. This is the second time a Bullish Island formation has occurred in the last one month. One can buy with a stop loss of Sensex 18467 and Nifty 5566. Both the indices have formed a Bullish Reversal pattern on the weekly charts besides forming a Bullish Breakaway gap on Friday. We can safely say that we are now correcting the fall from Sensex 20447 to 18467 and Nifty 6229 to 5566. The Retracement levels for that is 19222-19455-19688 for the Sensex and 5819-5897-5976 for the Nifty. This week both the indices managed to recover and close above the short term average of 20dma (Sensex – 19129 and Nifty – 5782) and also above the long term average of 200dma (Sensex – 19193 and Nifty – 5821). However, both the indices continue to remain below the medium term average of 50dma (Sensex – 19535 and Nifty – 5924). Thus the trend in the long term and short term timeframe has now turned bullish whereas the trend in the medium term timeframe continues to remain down. Once again the market just managed to bounce from above the Bullish Rising Gap between Sensex 18284-18062 and Nifty 5526-5447 this week. This gap was tested many times in the last couple of months and has proved to be a strong support for the market. In fact this gap has consistently provided support to the market. This gap holds more significance because a breach of this gap will signal the end of the long term rally. MACD and ROC have both given fresh Buy signals on Friday. RSI (53) too has given a fresh Buy on Friday when it went above the equilibrium line. Stochastic Oscillator continues in Buy mode as %K (42) is above %D. MFI has increased but is still below the centerline and hence continues with its Sell signal. The Sell signal for the Bollinger band given three weeks back stands negated as the prices have closed above the mean of 20dma. ADX continues to remain at a reduced to a level of 23, suggesting the current trend has almost all of its strength. The Directional Indicators have given a fresh Buy signal on Friday when +DI went above –DI. OBV too has started moving higher forming higher tops higher bottom formation. Thus majority of the Oscillators have reversed and turned bullish, suggesting short term bullishness. The Nifty O.I. PCR has improved to 1.37. For the July series, highest Open interest build up is seen at 5600 Put and 6000 Call. This suggests that the market expects a trading range with support at 5600 and resistance around 6000 levels. Lot of Put writing was seen at the strike of 5800 on Friday, which suggests immediate support. 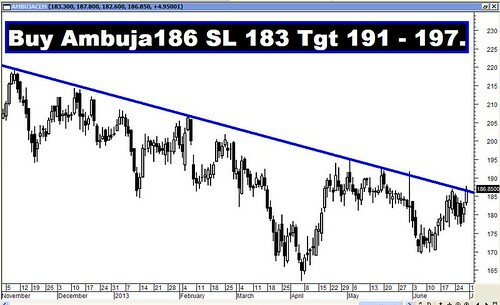 The Trendline Resistance for the Sensex is at 19720. Trendline Support is at 18462. The Trendline Resistance for the Nifty is at 5877. Trendline Support falls at 5577. For the week ahead, Sensex will find Support at 19093-18765-18467 and will find Resistance at 19652-19884-20146. For the week ahead, Nifty will find Support at 5749-5666-5566 and will find Resistance at 5936-6019-6114. All the major Recommendations did well to reach their targets with the exception of ACC and HDFC Bank which just missed their targets. However the Star Performer was JPAssociates which went down by around 17%!! !